The home page of the Hallo Northern SKY planetarium program. Welcome to the web page of the semi professional free planetarium program HNSKY for MS-Windows and Linux. This program can control your telescope via the ASCOM or INDI interface, has a comprehensive up to date deep sky database with 30.000 objects and detailed descriptions. A star database with millions of stars and hundreds of Deep Sky Survey images which blends in accurately. 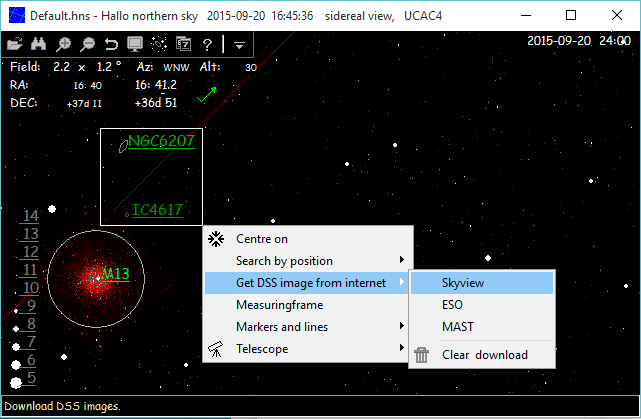 Additional the program can access the online version of the Deep Sky Survey allowing online update of the asteroid and comet databases and it can search on-line in professional astronomical databases. Is provided with menu's in 21 languages and it is totally free without any advertisement or restriction!! Free with 30.000 deep sky objects and native star databases up to magnitude 18. 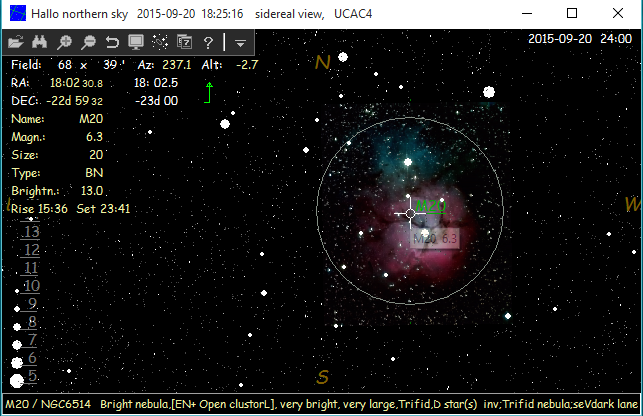 Online access to GAIA DR2, UCAC4, NOMAD and PPMXL star catalogues or download the USNO UCAC4 up to magnitude 16. The Sun, Moon, the planets and their major moons are all displayed with surface features. It maps the position of comets and asteroids with online updating. It is provided with hundreds of DSS deep sky images which will blend in at the correct size and orientation. It has a powerful animation menu. and an integrated deep sky observations help file with and 21 non-English menus. The MS-Windows version contains both 32 bit and native 64 bit versions. In can control almost any telescope using the ASCOM interface program. Works flawlessly together with programs like EQMOD and MaximDL. Downloading of additional DSS images via the Internet is fully integrated. Just select an area and select download.After a few second the DSS image will blend in the HNSKY map at the correct size and orientation. The comet or asteroid database can be updated online with just one click. Online database search for objects in the selected area. Numerical integration for asteroids to achieve highest accuracy positions years in the future or past. The error is less then 1" after 10 years !!! So an asteroid orbital elements from 10 years ago will after numerical integration allow position calculation within 1" accurate!! So also 10 years in the future. The program can use Jet Propulsion Laboratory Development Ephemeris like the DE431 covering years –13,000 to +16,999 for planetary positions. HNSKY v4.0.3b installer, can communicate with APT & CCDCiel . Dated 2019-4-15. See history for details. Alternative link. Additional star databases see below. For ASCOM 32 bit only drivers, install the 32 bit executable from manual installation below. MS Windows version 4.0.3b complete in a rar archive for manual installation (70 mbytes rar archive) Extract (and overwrite if required) these files to the HNSKY program directory or an other folder. The 64 bit version file is hnsky64.exe. Including the magnitude 12.5 star database. Additional you could download the G16 star database up to magnitude 16 from below. MS-Windows and Linux: Executables only, latest versions in a rar archive. History HELP file FORUM GUESTBOOK Screen shots of HNSKY.